What is a naseberry like? How a naseberry tree was saved from Hurricane Gilbert. When Hurricane Gilbert ploughed through Jamaica in 1988, I was fortunate to be staying at Silver Sands where I was consequently stranded for several days. There are many “Gilbert Stories” to be told, but this one is about the naseberry tree at Roots Cottage near the driveway entrance to Endless Summer. Hurricane Gilbert left many trees uprooted, lying helplessly on their sides. This naseberry tree was then only a few feet high and Gilbert had toppled it over too. When the Roots Cottage gardener came to work, I happened to be on the driveway at Endless Summer as he approached the tree with his machete in hand, ready to finish off what the hurricane started. I should perhaps pause my narrative here to tell you that I just love naseberries. 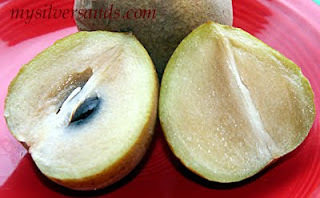 In my early childhood years, I knew this fruit as the sapodilla as that is what it is called in Trinidad. When I visited India, it was served to me as chikoo. But whether you call it naseberry, sapodilla, or chikoo (Manilkara zapota), I just can’t get enough of these sweet fleshy fruits that are not very common in the Western World. I won’t be surprised if most people reading this have never heard of naseberries, even if they have visited Silver Sands Jamaica many times. They are in season now (March), so if you are there, ask your housekeeper or cook or driver to get you some naseberries. Naseberries are picked when mature and ripened off the tree. The ripe fruit softens, and you simply break it open with the fingers to reveal a light brown to rust-coloured flesh with shiny black seeds. Some people eat the skin but I find it a bit rough. Discard the seeds and pop the juicy flesh into your mouth. It’s so sweet that the late Forbes Burnham, former Prime Minister of Guyana, once exclaimed that “only a woman is sweeter than the sapodilla”! Anyway, back to my story. As the gardener raised his machete over the naseberry tree, I shouted to him to stop. I quickly stepped over to Roots Cottage and I told him that we could save that tree. I started pushing it back up, and the gardener helped me straighten it up. He then recovered the roots with soil and staked and tied it firmly so it would not fall over in a gust of wind. Today that naseberry tree towers over the Endless Summer driveway some fifteen feet high, having survived a few more storms that have passed through the region. 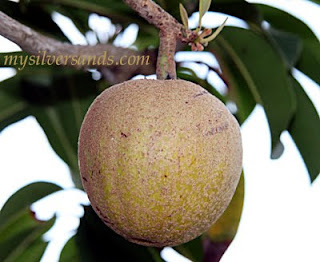 When next you are at Silver Sands, take a walk to the northwesterly end of the property and on the boundary of Roots Cottage and Endless Summer you will see a strong healthy tree which bears fruit generously. I get a great deal of satisfaction every time I eat one of its fruits. And wherever I am, whenever I eat a naseberry, I remember how I saved a tree from Hurricane Gilbert and an over-enthusiastic gardener at Roots Cottage. Find out more about Silver Sands.